Upon contemplation, we decided that the best thing to do is bring Pandora home to us and possibly provide her a companion (probably another pony we will buy – yes a pony for the pony!). 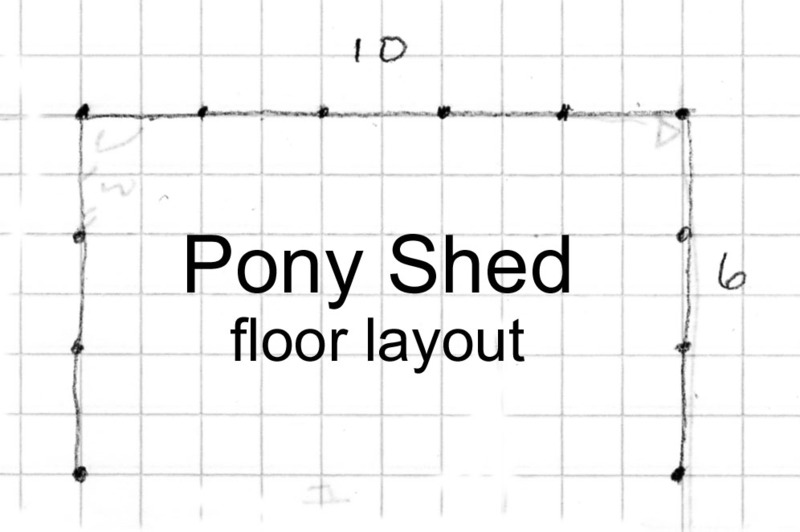 With that in mind, we started plans on building a pony shelter – a small loafing shed designed specifically for minis’ – that would be built on skids. This would allow us to remove it from the rental property at a later date and to move it about in the pasture if we found a better spot or wanted the first paddock area to rest. I discovered while researching moveable sheds is they may not (look at your own code) require a building permit because they are not considered a permnement structure. The size of your shed would also determine if it would need a building permit so doublecheck the city and county codes before beginning. First we settled on size. We wanted it big enough to house two minis and for an adult to walk inside. Husband is 6’2″ so the minimum height would be 7 feet. Finalized height would be 7′ in the front opening and sloping down to 6′ at the back. The width would need to allow two MINIS to access. Mini’s aren’t as big as ponies so if a standard horse stall is 12′ x 12′, I figured that a 10′ opening with a 6′ side measurement wall should work out just fine. I want the space to be small enough that two minis could snuggle up and produce mutual body heat. The bigger the shed, the harder that would be to happen. This shed will be three walled with one opening. 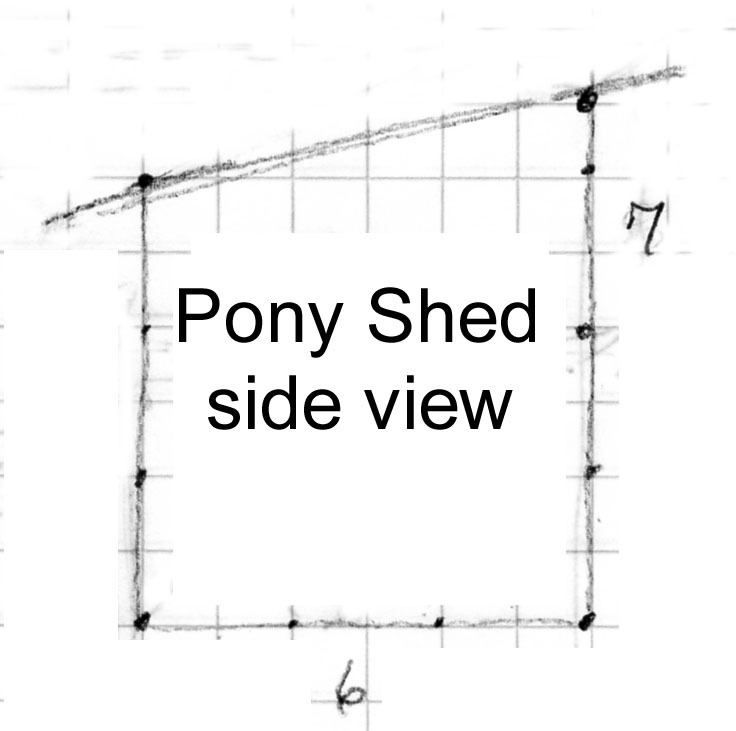 This should provide enough stability that the shed could be moved and the large south facing, opening allow the ponies to enter and exit without fuss. I’m not a big fan of sheds that aren’t not stabilized into the ground. I’ve seen one completely flip over and that was just due to high winds – no tornado. Scary! I’m hoping that being small this shed won’t run that much of a risk; we are also going to make a gap between the solid back wall and the roof to allow air flow though. The back lower wall would be insulated and covered with plywood. The reality of ponies is they are seldom in their sheds. They much prefer to stand out in the snow and ice so they can forage for food that perhaps someone accidently dropped or that Mother Nature is hiding! I’ve shown up in a blizzard with freezing rain only to find Pandora standing outside, icicles in her mane as she dug under the snow. Meanwhile, the horses, with layers of blankets, are shivering in their stalls asking for a hot toddy. This goat shed is too small but I do like the nicely angled roof and how well it is put together. The roof to our shed will also be a sloped platform like this one. Right now our plan has it overhanging the front and the back by one foot each. This brown shed is for horses. It has a sloped roof with a feed door access on the solid wall with some roof overhang. Clever! This shed was made from recycled metal paneling, most likely from ends of a barn build or even cut up metal sheds. BTW I’ve found metal sheds listed for very little to even free on Craigslist. I find it rather ugly myself, and the front opening that is further closed in just looks like a place for a pony to get boxed in during an altercation. As we start to build, I will take photos and also post a supply list and schematic on the structure. This entry was posted in Barn Design, Pandora. Bookmark the permalink.